WOW those birdies sure love your place. And another adventure begins. Ruby, guess you have turned into the animal shelter keeper, what you got next , frogs. IT IS AMAZING how many mom and dad birds are just..... FLOCKING to your place Ruby. It must be true what "THEY" say... LOCATION LOCATION LOCATION ! Those nests are so cool. A pic of you could never be gratuitous! Two years ago, we had doves in the awning-couldn't (because we wouldn't) drop the awning and we lived with sun in our eyes when we wanted to enjoy the outdoors. You have a regular birdie nursery in your yard! We would love to have you come over to our yard for a round of zoomies with us. It's lots of fun to run all through the shrubs too. TWO bird nests?!? how exciting! You've got a real nursery there, Rubie. You'll be very busy protecting all those birds. The birdies sure do love your yard, Ruby! Those are the best pics....how cool to have birds live that close. I tried to stand on my back legs and have a look into the nest in a tree...but Momma bird did not like it one bit....won't be doing that again anytime soon. 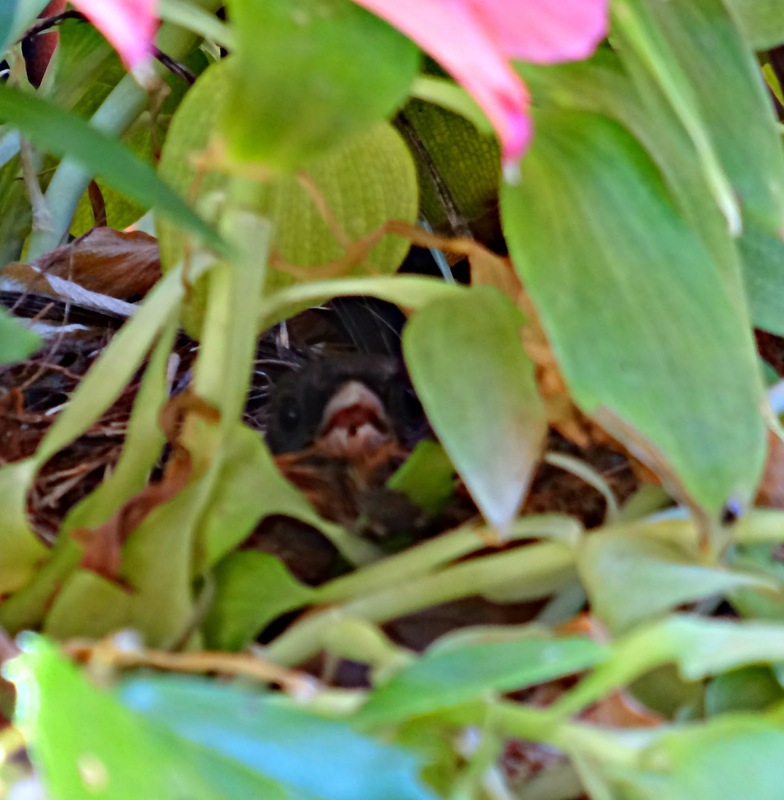 Your patio must be on the birdie Guide to Best Nesting Sites. Those birds do like to gossip! Wow, you are becomming a regular 'bird dog' Ruby! Take good care of all those little chicks, won't you. Happy Saturday Ruby my sweet friend. OMDS mom wished she had her camera with her today at Cameron Village she told me she saw to Ruby look-a-likes! I wish I had been there. We love Juncos here too but for some reason they have a nickname of snow birds here. They disappear to our mountains in the hot summer. You must be great at looking after the birdies, that's why they keep having their eggies in your yard! You must take really good care of them since the word is spreading that your house is the best place to nest ! Oh yes, you have got to get your picture in there fur sure!! Those birdies really like living with you, Ruby! We have lots of nests and birds too, I don't know why they like to nest here...Stanzie just tries to kill them all. The mama birds spend their days dive-bomb attacking Stanzie. You would think the birds would move and Stanzie would stop, but it's the same EVERY year.